His voice was angelic. Listen to just one word, hallelujah, from the song “She.” His voice treads so lightly over each syllable, you’d swear it was trailing off and floating up to the heavens. He could flat out sing you into submission. And when blend his voice with others, the harmony is so pure it’s almost too much to take. Check out The Gilded Palace of Sin or the Legacy Edition of Sweetheart of the Rodeo. But where to go next? 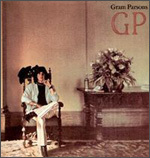 After his brief stint with The Byrds and Burrito Brothers, Gram Parsons was ready to fly solo, but he wanted to sing with a woman this time around in order to achieve the sound his new songs called for. As chance would have it, in steps Chris Hillman (again), suggesting to Gram the name of a young woman who he thought had potential. Her name, Emmylou Harris. I am not sure I’ve ever heard Emmylou Harris sing with anyone when it didn’t sound ridiculously lovely. Her gift has been spread over so many great albums with many different artists. But there is something particularly transcendent in the Parsons-Harris union. They were kindred spirits of country music whose voices were meant for one another. Luckily, fate saw to the rest, just as it did in pairing Gram Parsons and Chris Hillman. Lennon meets McCartney. Richards meets Jagger. Chris Hillman walks into a bank on Hollywood Boulevard, and who’s standing there, waiting in line? Gram Parsons. If you don’t believe in such things, more power to you. Queue the fiddle, grab your partner, and hold on tight. This is gonna be good. This is gonna be really good.